A comprehensive history of cancer - one of the greatest enemies of medical progress - and an insight into its effects and potential cures, by a leading expert on the illness. 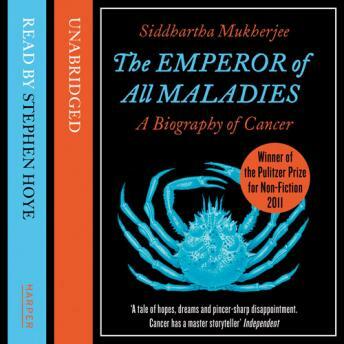 The story of cancer is a story of human ingenuity, resilience and perseverance, but also of hubris, arrogance and misperception, all leveraged against a disease that, just three decades ago, was thought to be easily vanquished in an all-out 'war against cancer'. Mukherjee recounts centuries of discoveries, setbacks, victories and deaths, told through the eyes of predecessors and peers, training their wits against an infinitely resourceful adversary.